Last week I explained how I estimated that the July 2009 federal minimum-wage increase reduced national employment by about 800,000. That 800,000 is the sum of employment impacts for each of several demographic groups and can therefore be used to estimate which groups were most affected by the wage increase. 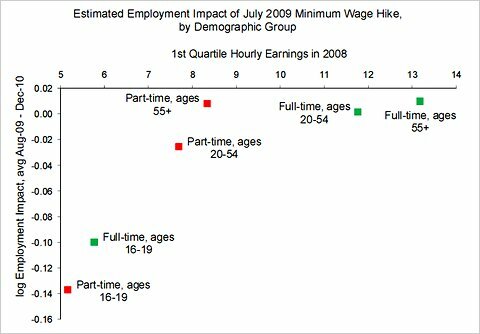 For each group distinguished by age and part-time status, I calculated “impact”: the percentage gaps between actual per capita employment after July 2009 and the employment I estimated to occur absent the minimum-wage increase. For example, I found the part-time employment impact among teenagers to be negative 14 percent: that is, 14 percent fewer teenagers were working part time since July 2009 as a result of the federal minimum-wage increase. The basic economics of the minimum wage suggests that employment impacts will be greatest among groups with the lowest hourly wages. Teenagers employed part time have particularly low hourly wages, and the hourly wages for teenagers employed full time are not much greater. The percentage impact on people 20 and over working full time should be essentially zero, because 98 or 99 percent of them would make more than the minimum wage anyway (see Table 1 of this paper). The chart below compares, by group, the minimum-wage increase’s employment impact (vertical axis) to a measure of the hourly wages of the workers in the lowest-paid quarter, shown on the horizontal axis). The diagram shows that impacts are negative, or essentially zero, and that the size of the impact is progressively smaller for groups with higher wages – exactly as economic theory predicts. Compare, for example, the minus 13 percent impact for teenagers in part-time jobs (25 percent of whom were earning less than $5.17 an hour in 2008 — note that a -0.13 log change is essentially a 13 percent reduction) with the zero percent impact for full-time workers 20 to 54 (75 percent of whom were earning more than $11.76 an hour). Teenage employment rates have fallen to 25 percent from 35 percent over the last four years. Much of that drop cannot be attributed to the federal minimum wage, but my estimates show that the federal minimum wage was a significant factor. Profs. William E. Even and David A. Macpherson also studied the recent minimum-wage increases for the Employment Policies Institute, using a different methodology. They focused on teenagers (not distinguishing part time and full time), and their state-level model included three federal minimum-wage increases (2007, 2008 and 2009). They found that those three increases cost 114,000 teenage jobs (I found 800,000 for all age groups combined, only some of which were teenage employment effects; Prof. David Neumark had estimated that teenage and young-adult employment would be reduced 300,000 as a result of the July 2009 minimum-wage increase). A minority of states were not affected by federal minimum-wage increases because their own state-legislated minimum wage would exceed even the new higher federal minimum (the federal minimum prevails over the state minimum whenever the former is greater). Thus, whatever jobs were lost because of the federal increase would be lost in the states — 31, after the 2009 increase — and the District of Columbia (which sets its minimum to be $1 above the federal minimum, so when the federal minimum jumps, do does the district’s). Professors Even and Macpherson’s state-level estimates confirmed that this was, in fact, the case. For the same reason that my model separately considered teenagers and part-time workers, Professors Even and Macpherson followed their teenagers study with a study of 16-to-24-year-old men with less than a high school diploma. They found that each 10 percent increase in a federal or state minimum wage decreased white employment by 2.5 percent, Hispanic employment by 1.2 percent and black employment by 6.5 percent. For the time being, at least, it seems that increasing the federal minimum wage again would give a few workers a small raise — but at the cost of eliminating entire paychecks for the young, less educated and least skilled. Based on my view that labor supply always matters, last month I predicted that teen employment would increase the summer, much like summers past, largely because summer is when teens become available to work. When more people are available to work, jobs are created. This morning the Labor Department reported that teen employment had increased about 900,000 from April to June. I expect that July will show still higher teen employment. Another federal minimum-wage increase would not, as some proponents promise, create jobs, but would reduce employment. Many economists expect the minimum wage, if it has any effect, to raise employer costs and thereby reduce employment, especially among people who are likely to work in minimum-wage jobs, like part-time workers. Federal and state minimum wages have changed a number of times over the years, and each of those instances provides an opportunity to test the employment-reducing hypothesis. For the episodes before 2007 (which I’ll refer to as the historical minimum-wage increases), many statistical studies of minimum-wage effects are summarized in books by David Neumark and William L. Wascher and David Card and Alan B. Krueger. Not everyone interprets the historical evidence the same way. The New York Times and the Center for American Progress cited some of that evidence to alleviate concerns that a minimum-wage increase would reduce employment. Even those who believe that historical minimum-wage increases did little, if anything, to reduce employment are still likely to appreciate that a minimum wage that was high enough — a hypothetical $100 an hour, for example — would significantly depress employment. The real disagreement is whether historical minimum wages were high enough, and the economic situations right, for those increases to destroy a large number of jobs. The most recent federal minimum-wage increase, on July 24, 2009, had the potential to have different effects than its predecessors. Adjusted for inflation (and deflation), by 2009 the real federal minimum wage had been raised to a level 32 percent higher than it had been in 2006 — nowhere near our hypothetical height, which we all agree would be destructive — but perhaps high enough to have some of those effects. In addition, during a recession hiring decisions may be especially sensitive to employment costs, though some economists say recessions make employment less sensitive to wages. It’s also easy to exaggerate the effects, good or bad, of the federal minimum wage, because seasonal workers, employees who rely on tips and others are exempt from it, and a few states have minimum wages above the federal minimum. 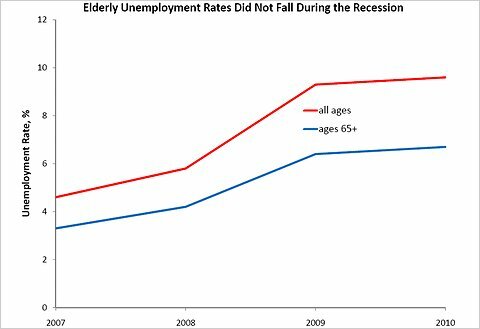 For these reasons, I have been studying the 2009 federal minimum-wage increase by itself and trying to separate the effects of the recession from the effects of the wage increase (see this recent publication for more details; my next posts will point to some other findings from the 2009 increase). 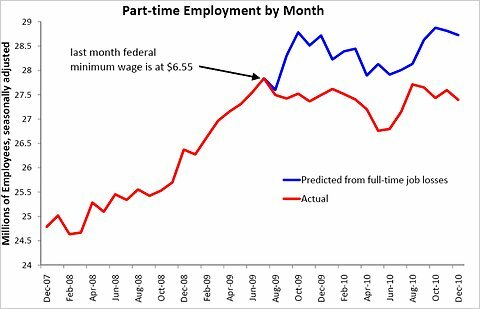 Part-time and teenage employees are especially likely to have hourly wages near the federal minimum. The red line in the chart below displays seasonally adjusted national part-time employment by month, from the Census Bureau’s monthly household survey. Before July 2009, part-time employment increased by about three million during the recession and that month reached the peak level of part-time employment. To investigate the possibility that the July 2009 wage increase stopped further increases in part-time employment and perhaps affected other employment categories, I estimated a monthly model of national part-time and full-time employment per capita for each of 12 demographic groups distinguished by race, gender and age (white and nonwhite, male and female, and 16 to 19 compared with 20 to 54 and 55 and over), using data from before the increase. I used the model to forecast part-time and full-time employment for each demographic group for August 2009 through December 2010. The aggregate deviation of the part-time predictions from the actual was added to the red line to arrive at the aggregate part-time prediction shown as the chart’s blue line. 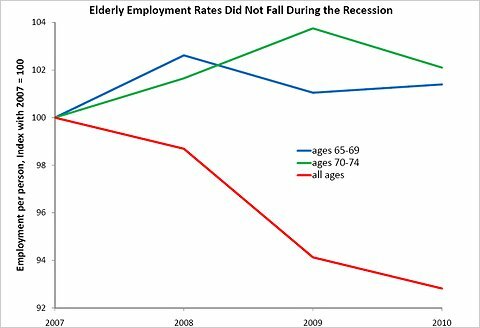 After falling 9.3 million during the recession through July 2009, aggregate full-time employment fell another 1.8 million by the end of the year and remained below July 2009 levels at the end of 2010. Some people dismissed from their full-time jobs probably had trouble finding another suitable one, and some of them worked part time while they searched. Consistent with this story, my estimates predicted that part-time employment would have continued to increase during the second half of 2009 because, before the increase, part-time employment tended to increase with full-time job losses. The actual and predicted data depart dramatically beginning in September 2009, with actual part-time employment 1.2 million below predicted part-time employment by December and averaging 975,000 part-time positions below what was predicted over the months August 2009 to December 2010. A small number of these job losses were offset by possible increases in full-time employment (relative to what it would have been – more on this next week). I find the total job loss from the July 2009 minimum-wage increase to be about 800,000. If raising the minimum wage reduced employment by 800,000, cutting it back to its early 2009 level is likely to increase employment by 800,000. That would add a bit to government revenue as some of those people moved from unemployment benefits to tax-paying workers.